The Bravo 4 is a great looking optic that performed as well as it looks. 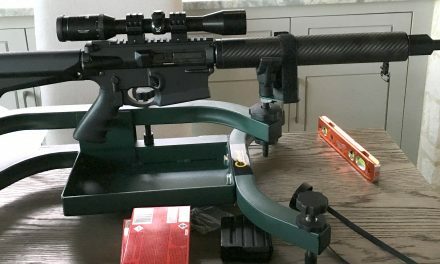 On a hot and windy weekend, I had the opportunity to put a Sig Sauer Bravo 4 optic through its paces. 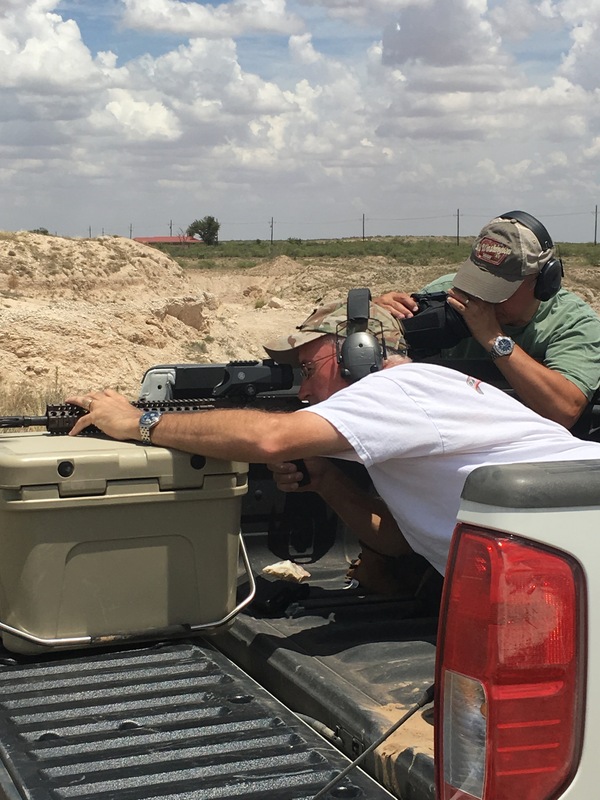 To help me in this endeavor, I enlisted the aid of one of my Army buddies, Jack Gex, who happens to be an exceptionally good shooter (he is one of the Texas “Governor’s Twenty”). Our initial impressions of the Bravo 4 were that it was unique looking and obviously well built. 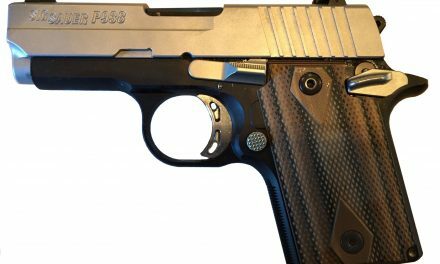 It has a futuristic profile that would be just as comfortable in a science fiction movie as it was on a makeshift 3-gun course. Jack and I loaded up the truck and left out of San Antonio on our way to the Midland area. We both caught a lot of grief about just how much stuff we had packed for a weekend trip; of course, it did kind of look like we were moving away from home. 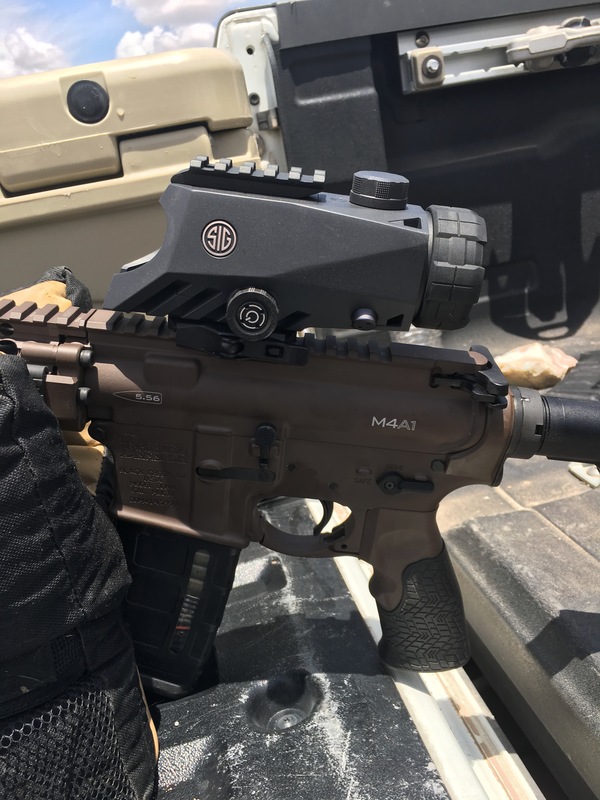 During the drive to up, we discussed countless ways that we were planning to put the Bravo 4 through its paces and how we would compare it to Jack’s Aimpoint PRO. We didn’t arrive to the family farm until late evening so there was no chance to punch out rounds upon arrival. The next morning couldn’t arrive fast enough as we were much like kids at Christmas – super excited to see what the day would bring. One unplanned but serendipitous event happened that allowed us to test a little more; I had my son-in-law’s brand new Daniel Defense M4 that was equipped with a Bravo 4 as well. He purchased the optic and the weapon purely because of my recommendation and because he had the opportunity to look through my Bravo 4 before it had even been fired. As an aside, I can very comfortably say that his rifle and optic combo is one of the sweetest setups for an AR pattern rifle that Jack and I had ever had the pleasure to shoot. Zeroing the Bravo 4 on the Daniel Defense M4. 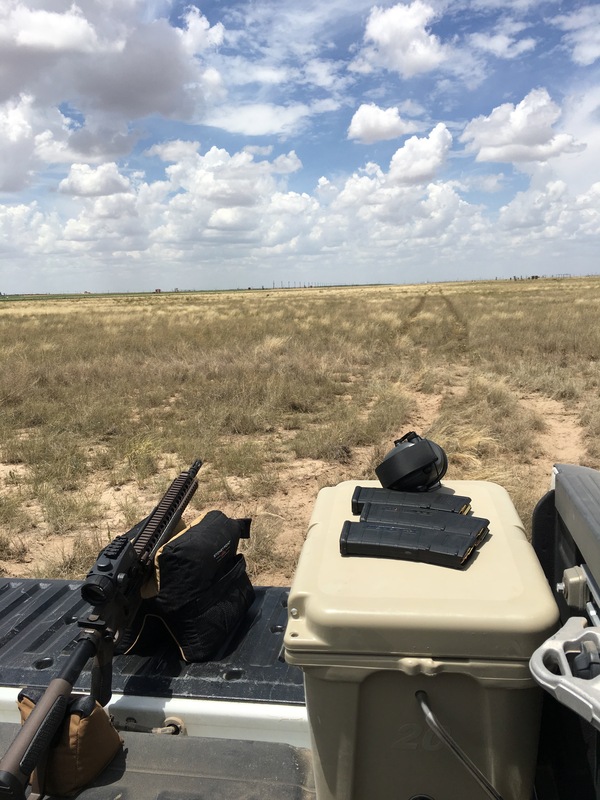 Day one was spent in the caliche pit zeroing my Colt LE6920 and the Daniel Defense M4. Installing the Bravo 4 was intuitive and didn’t require any review of the owner’s manual. The built-in picatinny rail adapter had a nice “locking” mechanism that provided additional retention beyond just screwing it onto a rail. Using a 100 yard zero, it took nine rounds to zero the Colt and six rounds for the Daniel Defense. Both optics had very clean and crisp images with no noticeable distortion at the edges and with true colors. The 4x magnification made things very easy. 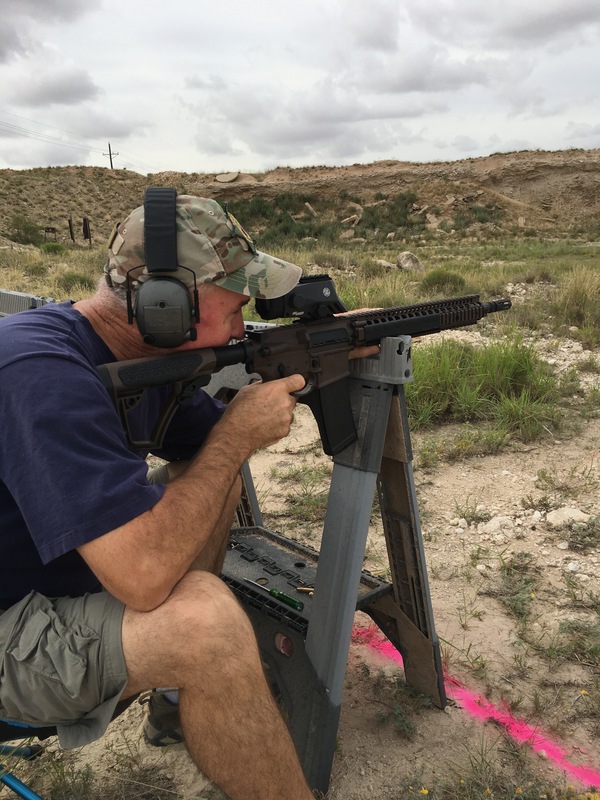 Jack had brought a Rock River Arms M4, equipped with an Aimpoint PRO with a 2 MOA dot. During the precision shooting, we both shot much better groups with the Bravo 4. The crispness of the Bravo 4 reticle made for easy and repeatable target hits. After zeroing, we immediately set about gathering paint cans and empty bottles to shoot. It is very satisfying to line up a dozen bottles at 100 yards and then break them all rapidly (under 10 seconds) and without missing. I personally believe that shooting these types of targets as opposed to bullseye targets makes you a better marksman. Anyway, it didn’t take long for us to decide we needed more challenging shooting scenarios, so we designed a mini 3-gun course with four stations. The first two stations were at 100 yards (for bullseye) and 50 yards (to engage three spinning targets twice each). Afterward, we transitioned to 25 yards, a shotgun, and eight clay targets spread 180 degrees. We finished at seven yards with six bottles on a fence rail. At this point, my niece and her boyfriend joined us and were very excited to shoot the course. The Bravo 4 equipped rifle shot more accurately, consistently, and quicker than the Aimpoint from the 100-yard line. The 4x magnification wasn’t overwhelming and I could as easily shoot with both eyes open as I could with one eye. Jack experienced the same. 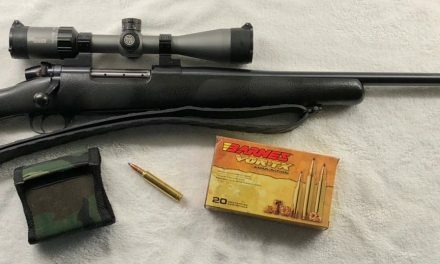 When it came to shooting the spinners off-hand at 50 yards, the Bravo 4 again shined and was faster than the Aimpoint. I was expecting the Aimpoint to be faster but was pleasantly surprised with the Bravo 4. By the end of the 3-gun course, we definitely added two more enthusiasts to the 3-gun crowd and I know we will be recreating the course again soon. There is actually a pink target 600 yards out there in this picture. To finish off day one, we put out five baby food sized jars of Tannerite at approx. 300 yards. It was approaching dusk and the lighting was poor, so it gave me a chance to really use the illuminated reticle. I hadn’t previously noticed the illuminated reticle lines, just the dot and horseshoe. Without an illuminated reticle, it is doubtful either of us would have hit a three-inch target at that distance at that time of day. It still took about twenty rounds to successfully engage all five targets, but the explosive response made for a great end of day shoot. Day two was all about long range. I was very interested in seeing how accurate the BDC was. 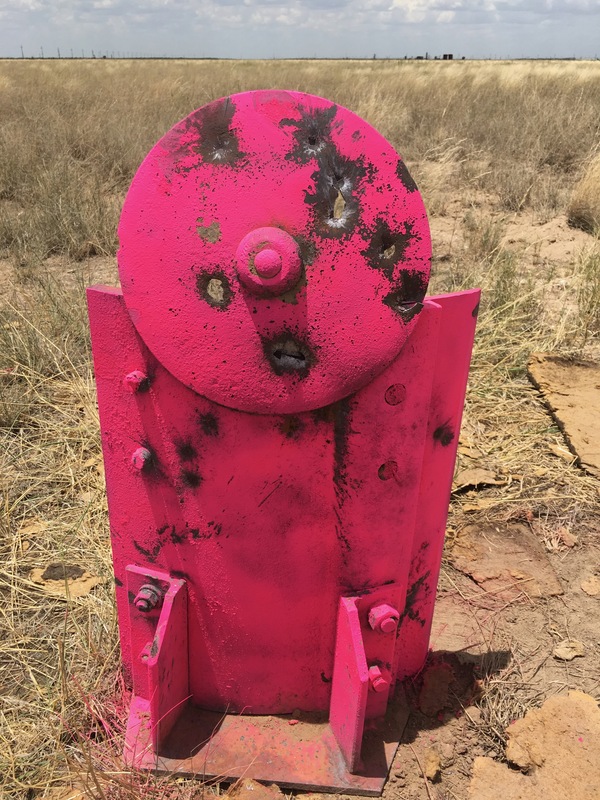 We scrounged up some old tractor parts on the farm, spray painted them bright pink and put the target out at 600 yards. The wind presented a pretty difficult challenge all day for day two as it was gusting to 20 mph and stayed constantly about 5 mph. Since I knew the target was exactly 600 yards out, I laid the “6” crosshair on the target and eased off a little to account for wind. All told, we probably fired a hundred rounds at 600 yards and hit enough times to satisfy ourselves. Based on the accuracy of the rifle and the optic, any misses that we experienced would have been close enough to keep an adversary’s head down, if not hitting them somewhere else along the body. Unfortunately, the wind was so stiff that we very rarely could get the audible feedback of the rounds striking the steel. Over the course of two days, we fired about a thousand rounds through the three M-4s. We shot 40 grain V-MAX bullets, 55 grain FMJ, and 62 grain M855 (green tip) ammunition. The BDC reticle on the Bravo 4 was spot on for the various ammunition types. In conclusion, we were both substantially impressed with the Bravo 4. We experienced no difficulties in zeroing or using the optic. The ranging stadia lines were accurate and easy to read. The optic shot well using one eye or with both eyes open. 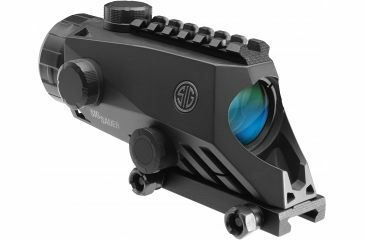 It had a noticeably wider field of view than the Aimpoint. The only recommendation I have is to make the BDC stadia lines finer. At 600 yards, the reticle covered up the target. All in all and with great confidence, I am very happy to recommend the Bravo 4 to anyone that is searching for a great optic for an AR platform rifle. I also want to thank Sig Sauer and especially Craig Pfeifer, for giving me the opportunity to evaluate the Bravo 4. Me (on left) and Jack as conquering heroes over the mighty pink 600 yard target. What can I say? Gear-finding is a passion (sickness?)! 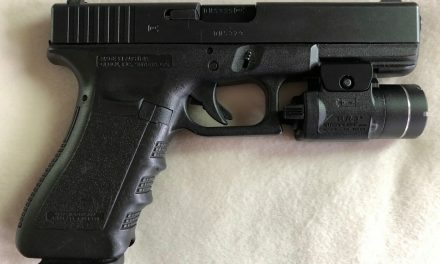 Hope this blog helps others find the right guns, gear, and services.